If C1-10P is the cat to R2-D2's dog, then "The Forgotten Droid" was about that cat meeting a stray and guiding it home. But what happens when the cat remembers that it's a loner for a reason? That's the question I was left with at the end of this episode. Yes, Chopper made a friend. But nothing that happened in "The Forgotten Droid" changed his essential nature: grumpy, selfish, and lazy. His encounter with AP-5 offered a few laughs and a study in contrasts, but it didn't produce any character growth—because, for reasons of series structure, Chopper must remain trapped in his stereotypically cantankerous role. Just like in every previous episode, Chopper demonstrated no interest in the mission at hand. Forced to stay behind on the ship because he wasn't needed, he bristled at the need to play a supporting role. Perhaps he craved the excitement of direct engagement with the Imperials; perhaps he'd just rather be getting an oil bath back on the fleet command ship. Either way, as soon as he spotted a replacement leg for his chassis sitting in a junk shop on Horizon Base, everything changed. Suddenly, he had a personal goal. He wanted to replace his ugly leg with a better-fitting one. But of course, the other rebels didn't care. They were on a mission and had bigger things to worry about. His servile position, combined with the lack of respect from his friends, led Chopper to abandon his post. Despite rendering crucial assistance to his team in the past, the beginning of this episode emphasized a key fact that is often overlooked in discussions of how adorably cantankerous Chopper is: He really isn't a good team member. He doesn't take missions seriously and lets personal interests distract him despite the stakes. This was the first time we saw Chopper abandon a mission for a personal goal, but it wasn't the first time he let his team down. On many past missions, he did his job only reluctantly or half-heartedly, usually out of fear or annoyance. Despite this episode's resolution, it became clear at the beginning that, when the chips are on the line, Chopper only cares about himself. It's not as if I don't understand the plight of droids in the Star Wars galaxy. Several interactions between organics and droids in this episode reinforced that they are mistreated, misjudged, and undervalued. The Ugnaught salesman from whom Chopper stole the leg asked him where his owner was, assuming that he belonged to someone rather than forming part of a team. (The juxtaposition between that line and the Ghost taking off in the background was hilarious, by the way.) This was a reminder of the fact that, in Star Wars, most people wouldn't believe that a droid could be independent. We're so used to knowing independent droids in Star Wars stories that we often forget how they usually fit into society: as servants. "The Forgotten Droid" was rife with demeaning remarks about droids and assumptions about their servile nature. One of the great contrasts in this episode was between organics' treatment of droids as servile automatons and Chopper's own humanlike behavior. The sound team seemed to go out of their way to make Chopper's vocalizations understandable—every time AP-5 repeated a line back to him, you could retroactively make out the human words in his sounds—and the animators threw in hilariously anthropomorphic gestures, like when he kicked the replacement leg up into his grasping arms the way a human might do. We also learned something new about Chopper in this episode that further humanized him: He served in the Clone Wars and his Y-wing was shot down during the Ryloth campaign, whereupon Hera rescued him. AP-5, who was clearly more perceptive than his menial job indicated, had to remind Chopper of what this meant: "You're fortunate to have someone who cares." AP-5's own plight, combined with the reminder of Hera saving him, prodded Chopper o consider what should really matter in life: his family. Whether or not he recognized the lesson here—that he didn't treat them well enough—was unclear. And the reminder of his rebel family clashed with the fact that Chopper never seemed to respect them the way a family member should. One-off characters are a gamble: The episode depends on them, but they're probably not going to stick around, so you have to know just how much to give the audience and just how much to hold back. Spend too much time developing them and you frustrate the audience by never paying off that development. Sketch them out only halfway and they aren't substantial enough to do their job in the episode. AP-5 was the perfect secondary character. We learned just enough about him to make him interesting, but not so much that, if he never appeared again, it would feel like a waste. AP-5's relationship with the captain of his freighter—a fat, slovenly, abusive man who treated droids like dirt—formed the backbone of the droid's character development. The captain was the perfect contrast to the rigid, monotonous, by-the-book inventory droid, and the tension between their demeanors was brilliantly apparent, as AP-5 displayed exasperation with the captain's carelessness. Even more important to the story, though, was the fact that the captain enjoyed tormenting AP-5. The Imperial didn't think of AP-5 as a sentient being; he just a thing to be toyed with, a way to let off some steam during a boring workday. His cruelty would prove to be his undoing. Even though no one respected him—with a stormtrooper not even bothering to acknowledge him when they bumped into each other—AP-5 remained a robot with clear programming, bound to his job and determined to execute it efficiently. He took pride in having logged everything on the ship; despite the lowly task, he enjoyed knowing that he had done it to the best of his ability. But this fastidiousness was partly the result of his restraining bolt, which enslaved him and limited his ability to think or act independently. His encounter with Chopper changed everything for him in a way that was a treat to watch. Chopper and AP-5 couldn't have been more different. 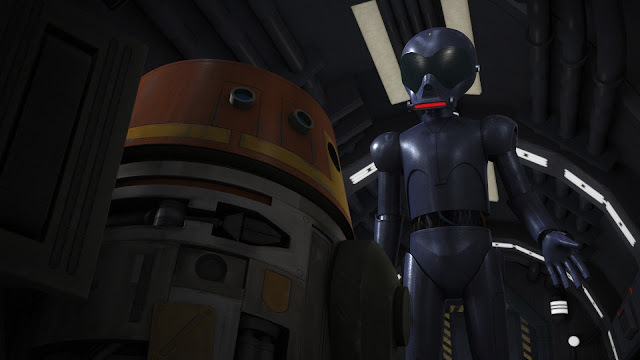 Whereas Chopper was a free droid with people who cared about him and no desire to help them, AP-5 was a servant to a careless master and couldn't refuse orders even if he'd wanted to. Voice actor Stephen Stanton accentuated the differences between the two robots by giving AP-5 a bored, contemptuous voice—it sounded, to me, exactly like Alan Rickman's Severus Snape—to contrast with Chopper's excitable, vivacious personality. Were it not for the captain of the freighter, things would have gone terribly for the rebel fleet in "The Forgotten Droid." Whatever interest he had in Chopper, AP-5 was bound to his "tedious occupation" and knew he had to obey orders. Thus, he checked in when the captain called him. But when faced with the obligation to report Chopper's presence—which would have ensured the droid's capture and prevented the rebels from learning about the Yost trap—AP-5 broke with his programming because of the captain's abuse. He chose the droid that was treating him somewhat nicely over the human who was treating him like scrap. Ironically, the captain's foul behavior had cost him the loyalty of a droid whose loyalty he took for granted for mechanical (restraining bolt) reasons. AP-5 soon fell in even deeper with Chopper, despite his initial misgivings. As he helped Chopper carry away the captain's inert form, one could tell that it was because he starting to like the squat, rambunctious droid. In fact, AP-5 seemed to take on the C-3PO role to Chopper's R2-D2, scolding the rebel droid about the long odds of his plan succeeding and continuing to critique it even as it worked. Chopper stunned AP-5 on the bridge of the freighter by calling him a friend. AP-5 was clearly taken aback because he had never considered the possibility of a droid having friends. (Again, remember: Probably 90 percent of the droids in the galaxy experience nothing close to independence or voluntary relationships.) Indeed, this was a new thing for Chopper, too. And because Chopper was still, ultimately, Chopper, part of me wondered if he was just using AP-5 to get home. AP-5 didn't seem to feel this way—he respected Chopper enough to save his friends by warning them that the Yost system was a trap—and Chopper seemed to demonstrate his sincerity when he mourned his friend's temporary deactivation after the captain shot him. Despite her background role, Hera played an important part in the episode by representing the rest of their rebels in their relationship with Chopper. As the rebels departed for their mission, she urged Chopper to focus on the mission, displaying exasperation as his dome drifted away from her and toward the replacement leg while she was still talking to him. Chopper was the classic petulant child in that moment. And that impression stuck with Hera as she scrambled to get the fleet to safety. "I know that droid," she said. "He's always thinking about himself." The thing is, she was right. Chopper has never prioritized the greater good when he could help himself instead. Hera had a hard time accepting that Chopper—whom she called by his formal designation in a moment of anger—had made a friend, because she had spent so much time with him that she knew what he was like. "Chopper doesn't have any friends," she told AP-5. The inventory droid tried to convince her otherwise, easing her anger by reminding her that she'd saved Chopper's life during the Clone Wars. But Chopper clearly has not repaid his debt to Hera with anything approaching loyalty, and it was hard to imagine that his friendship with AP-5 would go any better. Before I conclude this review, I want to note a few other things that stood out to me. First of all, where did Ketsu come from? It was never established that she'd begun working with the rebels. The last time we saw her, it was in a "maybe I'll see you again sometime" context. Her sudden reappearance deserved an explanation. But more important to this episode was the series of puns directed at Chopper, who, like many of my own friends, could not have been more annoyed at them. Zeb got things started by mocking Chopper's interest in the leg with a "Shopper" joke. Ezra followed up by telling him to "get a leg up on the Empire." And the Ugnaught salesman completed the trifecta by saying, "I won't charge you an arm and a leg for it." As a lover of puns, I was gratified to see Rebels include several and even more thrilled that they were aimed at Chopper. So, will Chopper change his ways now that he's made a friend? Color me skeptical. Yes, he sacrificed the very thing that had led him on his adventure in order to save AP-5's life—giving him what appeared to be more of an attitude in the process—but there's a big difference between foregoing a limb replacement and proactively risking your neck. I doubt Chopper will be rushing into danger the way the rest of Hera's crew does any time soon. The series set him up as the sadistic, cantankerous rust bucket who plays pranks on Ezra and grumbles about the tasks Hera gives him, and the writers don't seem intent on changing course with him. In any event, I doubt many fans would even want that. Chopper seems to be stuck in his ways, and that partially undercut the feel-good nature of this episode's ending.